Chinese language may be 'almost' one written standard [the recent simplified Chinese actually undermines this ] but is spoken variously. A social and scholatic 'trick' is the play upon this. The Song Dyansty is considered famous for its' poems and poets [ one of them having a name closely to Zhu ji ]. Thus, I and some others have quesitoned as to why the LiuHeBaFa-named exercise and poems is linked to the Song Dynasty and to the high, prison-like mountain Hua-shan or Hua-Yo [Hwa-Yue]. Toying with just this name brings out the similar phonetics of 'changing + fish' which also is symbolic for the yin-yang concept and this links to 'taosim' which the Song Dynasty was something of a Renaissance for Taoism and Buddhism. I will give a caveat here, the phonetic variations [using all possible tones and similar vocals] can issue interesting and believable subtle meanings which can be accepted as believable; this however does not mean that this was intentional. Tai Chi Chih 太極尺 Tai Chi Ruler or wand. 周敦頤, starting from an interpretation of the Book of Changes 易經 Yìjīng, The Book of Changes ("I Ching") classic work. The similarity of tai-ch- to tai-zu phonetically and their relations is worth a look. Tai Zu 太祖 Taizu-quan 太祖拳, Great Ancestor Boxing. 宋太祖 Sòng Tàizǔ, Emperor Taizu of Song, posthumous title of the founding Song emperor Zhao Kuangyin 趙匡胤 (927-976), reigned from 960-. Bai Yuan Tong Bei Chuan, 白猿 通回到拳擊 'White Ape' -Tong-Bei- 'Through-Back' Fist-Boxing . Bai yun-zong 白雲宗, was a type of Buddhist Sect, white cloud sect. stay, to keep, to preserve; 流 to flow, to spread, to circulate, to move. This number is a homophone for 'blessings' 祿 Lok. In the I-Ching, Book of Change, 6 stands for "yin" aspects. Ba 峇 cave, cavern, 岜 rock mountain, 拔 select, promote, 把 handle, ( a measure word ), to contain, to grasp, to take hold of; sounds similar to the word which means "prosper" or "wealth" 發 . He is also identified as Neo-confucian relating Li 理 natural orders dependence upon chi 氣 to create structure. 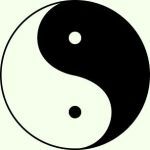 The later yin-yang spiral-orbit symbol well-known, is ascribed to scholar Zhu Xi [1130-1200] The..two. swimming fish orbs. Its importance is as a symbol of motion and reversal by traversing the center. The Records of the Grand Historian, written from 109 to 91 BC, was the work of Sima Qian, also known as Ssu ma Chi'en, recounted Chinese history from the time of the Yellow Emperor until his own time, a 2000 year coverage. Fuller details to this are given in my reference text, 4th edition.